#3 Terriers take on #8 Boston College for the third time this season in the opening round of The Beanpot Tournament. BU and BC will play the late game, set for 8 p.m. (although it always starts later). TV coverage is on NESN and TSN2. This year’s tournament is the 65th Beanpot. BU has claimed the silver pot 30 times, while BC has won 20 times including a year ago when it defeated the Terriers, 1-0, in overtime. BU’s most recent win was in 2015 when Matt Grzelcyk’s overtime goal pushed the Terriers past Northeastern. Nine current Terriers were on the 2015 Beanpot title team, while 16 return for the 2016 runners-up. The Eagles’ offense is led by seniors Matt Gaudreau with 26 points, sophomore Colin White (23 points, 13 goals), senior Austin Cangelosi (22 points) and sophomore Chris Brown (22 points). Freshman Joseph Woll, who split goaltending duties with BU’s Jake Oettinger for two seasons with the USNTDP, will be in net for BC. For BU, all hands are available with the exception of Nikolas Olsson who underwent surgery for a broken leg bone last week. 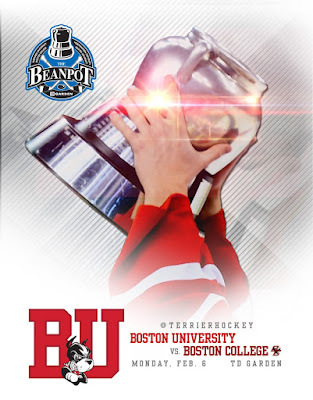 The BU Alumni Association is sponsoring Beanpot Watch Parties in 17 cities. Click here for all the details. ►Max Prawdzik stopped 35 shots to gain his first NAHL shutout, as Lone Star blanked Wichita Falls, 4-0. 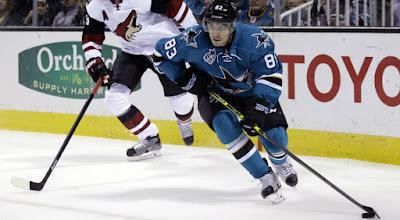 The Terrier-on-loan improved his record to 5-0 and lowered his GAA to 1.79. Matt Nieto recorded his first two-goal game of the season in the Avalanche’s 5-2 win against Winnipeg. Jack Eichel assisted on a pair of goals in Buffalo’s 4-0 win over the Sabres. Evan Rodrigues tallied a pair of goals in Rochester’s 4-2 win over Hartford. Chris Bourque’s 14th goal was the game winner in Hershey’s 3-2 win over St. John. Sahir Gill scored his second goal of the season in Wilkes Barre/Scranton’s 5-0 win against Lehigh Valley.